Sales Training CompulsoriesThe objective of this training program is to provide basic lighting product knowledge, company policies and procedures, sales automation programs, and FAB (Features / Advantages / Benefits) sales skills for the newest members, including sales reps and marketing personnel. This is scheduled on a need basis, for those new to the company and/or the lighting industry and can supplement your own orientation training. This is an important one or two-day training program for seasoned /senior sales professionals. 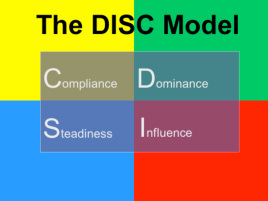 As the title indicates, this training is strategic in nature…………..to get the more senior sales people thinking about solution selling to deal with the difficult issues they face in today’s changing marketplace, such as pricing, competition, industry consolidation, customer shifting, supply chain management, etc. In addition, technical energy efficient products can be part of this curriculum to encourage understanding of the technical sale. Create Demand Selling© Satisfying demand is a commodity sell that perpetuates the sale of existing products. Outside sales people making the rounds to pick up orders just do not cut it anymore. 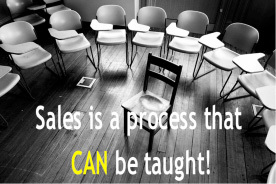 Today’s sales professional is expected to make things happen……..to create demand. Creating demand is effectively educating and convincing the customer to buy when the need to upgrade is clearly identified and satisfied….to improve the business of the customer. This one-day sales training workshop is basic in the new technologies in the lighting business, and the advanced sales skills and techniques needed to sell in a dynamic changing market environment. To convince today’s customers to upgrade to the more technologically advanced lighting products because of bottom line improvement and productivity gains that will be realized. An important asset of any company, especially one involved in the distribution of products and services, is its sales force and its ability to solve problems in today’s increasingly diverse and global workplace. This one-day advanced sales training workshop focuses on assessing the individual strengths and weaknesses and the sales skills necessary to recognize and to solve today’s nagging problems that are impediments to successful sales closure.Using a highly successful self-assessment instrument (DISC Model), the workshop provides the attendees an understanding of different behavioral styles essential for managing and selling more effectively in a diverse environment.Before the session, all participants will be asked to complete an online assessment: The Success Insights® DISC Profile Behavioral Assessment – an analysis of each individual’s behavioral style is used to increase your self-awareness and abilities to develop adaptive styles to meet the demands of your work and customer environments. 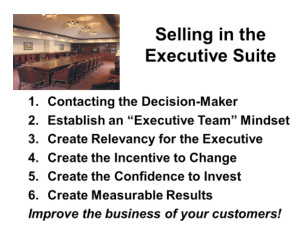 Selling in the Executive SuiteToday’s sales professional skills just have to be more than just selling product. This workshop focuses on techniques to develop close relationships with the executive staff of your customer. To convince them that you are part of that executive staff to do your part to improve their business. First you need to determine who gets invited into the executive suite and how to reach them.